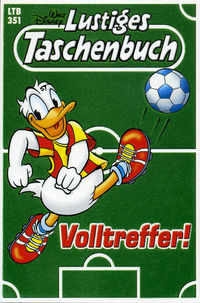 Passend vor dem Start der Fussballweltmeisterschaften in Deutschland gibt es Das Lustige Taschenbuch diesmal mit echtem Kunstrasen am Cover. Ein haptisches Vergnügen so wie die Geschichten seit jeher vergnüglich waren und immer noch sind. Vielleicht ein passendes Geschenk zum Vatertag mit egozentrischen Hintergedanken? Q: Vinnie Jones on some British TV show said X-Men 4, X-Men 5, could we say yes or no is that true? We are going to see more of the X-Men world? Tm Rothman: You’ll see more of the X-Men world. You know, we’re developing a Wolverine movie right now, we’re developing a Magneto picture. What I will say is, I’m gonna give an Alan Greenspan type answer but it’s the truth which is, which I am sure will parse endlessly, this movie which I can tell you now the official title, if you like you can break that story, is X-Men: The Last Stand, it’s is the conclusion of this trilogy. These three movies work as a trilogy. These characters in this relationship, it’s the culminaton of that saga. It’s the culmination and the resolution of those relationships laid out in the first two movies. That doesn’t mean never, I would ever say never again but I will say that this brings that saga to an end. It’s quite the way the last Lord of the Rings, Return of the King, brought that trilogy to a conclusion in terms of those characters, that’s what this movie does. It goes all the way back to the first one and rounds off and completes that three part story.